Stunning template estate agent websites that attract and convert leads with the latest technology and award winning design. 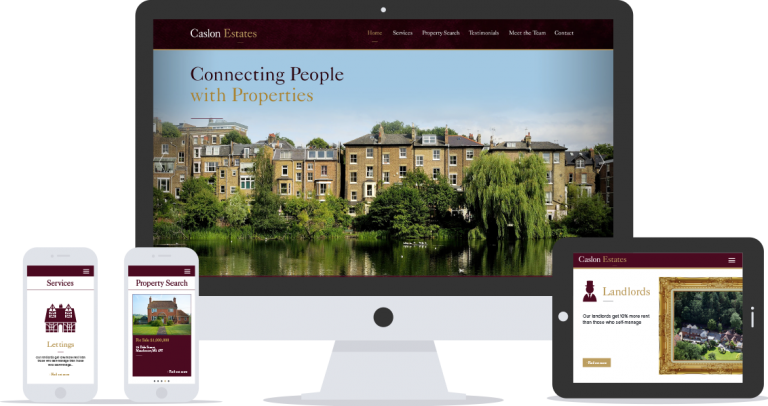 We design stunning websites that stand out from the typical outdated estate agent style. With a dynamic use of imagery and eye-catching calls to action, the websites we create are of the highest quality and designed specifically to attract and convert leads. Ensure your properties and other details are always up-to-date on your website with our property software integrations. We'll ensure your property data is consistent and regularly up to date. We've worked with almost every property management system out there and know how important this is, so the cost for this is nothing! It's free with all of our estate agent websites. With a large portion of website traffic coming from mobile, you can't afford to miss out by not being responsive. Our websites are built from the ground up to look beautiful on mobiles, tablets and desktops. All of our template estate agent websites are search engine optimised and include well thought out calls to action and data capture forms as standard. We are a completely in-house team and our developers are the best in the business. We don’t cut corners and create websites which can adapt and change as you business does. Not everyone has a big budget, that's why we've spent years perfecting our basic website package so that it includes all of the essentials an estate agent needs. For those that need something extra, we have a great list of add-ons and we can also create bespoke solutions. We've developed a wide range of bolt-on features such as appointment booking and live chat. We host our websites on top notch servers which are regularly backed up, updated and monitored to ensure your website remains stable and visible. 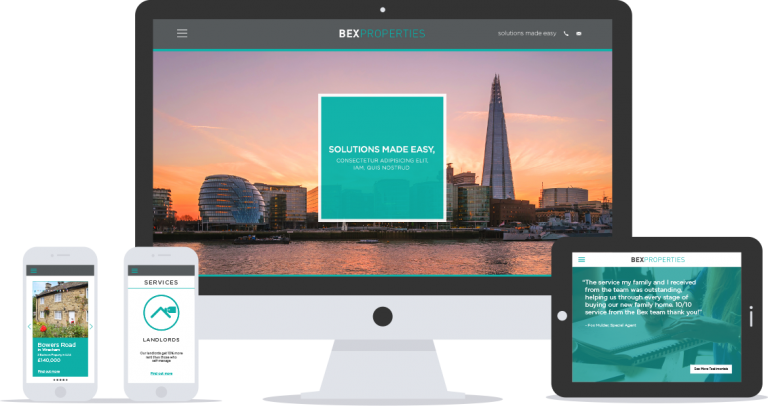 Clean, modern and friendly in it’s design, Bex is an ultra responsive website using bold calls to action throughout the site to captivate potential customers and turn them into leads. Supported by stylish imagery throughout, Bex is our most popular design and gets results for ambitious, growth driven agents of all size. 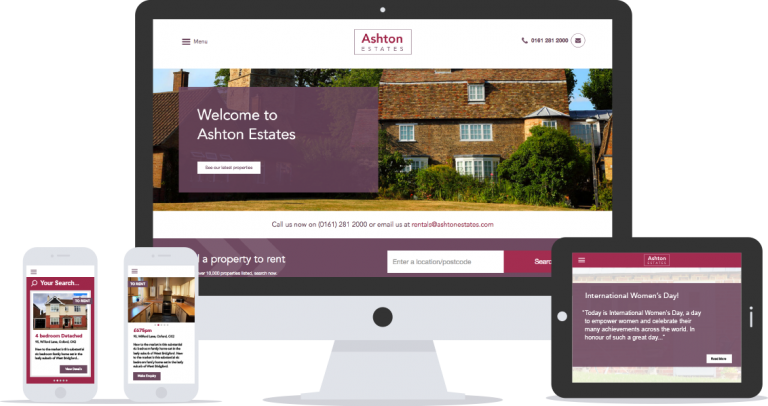 Ashton offers a unique approach and innovative alternative to the standard estate agent website. Making use of strategically placed content using box-like design, Ashton really helps you shout about your business with pride. Ashton is great for those who dare to be different! 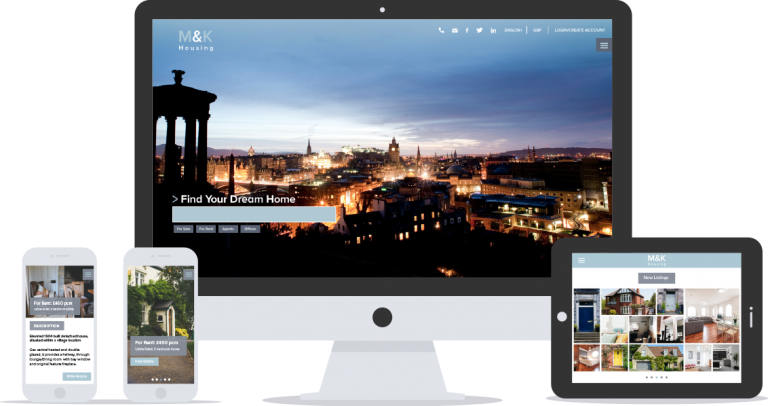 Featuring full-screen, hi-res imagery and stunning design, M&K makes any property professional stand out across desktop, tablet, and mobile devices alike. With a modern and slick design, this is the option for the forward-thinking, brand focused estate agent who wants to make a lasting impression on customers. Does your brand scream luxury? If so, tell your target audience with Caslon. A simplistic and modern full-width design, paired with elegant photography, offers a touch class. Caslon is the obvious choice for estate agents who want to apply a high-end, luxury feel to their business. We guarantee that a Property Stream website will make your business stand out from the crowd. If you are not entirely happy we will give you your money back! 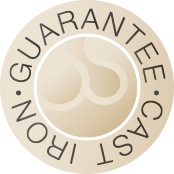 Looking for a more bespoke package to stand out from the crowd? Find out more on our bespoke estate agent websites page. "Property Stream have been a breath of fresh air, with a dynamic approach to the rebrand and website of Meyers Estate Agents. They have created a vibrant and strong image of our company. Great people to work with and I would recommend their services to anyone."